The following scrolls were made for a Dojo just south of where I went to Graduate School (University of Memphis). 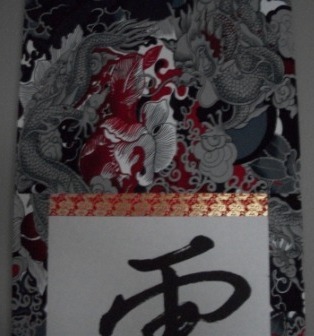 This pair of scrolls is beautifully written in a Gyoushou style. Both scrolls say 雷電 道場 Raiden Dojo, or Thunder & Lightning Dojo. It is very appropriate considering the last name of the Sensei which I will not reveal. One is a Joufuku size scroll and the other is a Yatsugiri size scroll. The cloths were chosen to blend with the colors of the dojo, which are black, gray and red. The Red Ichimonji particularly stands out and I think provides power to the effect of the scroll. Two other things you will notice is that the Ten on the Joufuku scroll is particularly long. I did that on purpose so that a full dragon could be on that portion of the scroll. The second relates to the writing. Both Rai and Den have the identical radical. However, Yoshimi chose to write them differently. I asked her why and she said it would be boring to have both in the same gyousho style. There are variations within the Gyousho style, but that is a separate topic. Reading about the devastation that occurs makes me sad. I have heard from my display Sensei Kuzuhara Hiroyuki that he is OK. My scroll making Sensei Sagawa Taishin I have not heard from yet. I pray everything is well with him. My wife's family is also safe. I pray that everyone can survive both the physical and emotional turmoil that has afflicted them. I was ecstatic with the result of the scroll except for one little bulge that has been taken out during the Urazuri process.